I had a theory going into this blizzard. If I got a small, I wouldn't like it and would waste half of it. If I got a mini, I would really like it and be hungry for more. The good (yet slightly) bad news is that I went with the mini, and I did indeed enjoy the blizzard (and I was still hungry). I take my first bite and I'm instantly transported to the world of ice cold pumpkin pie. You see, I really don't enjoy hot fruit pies, I like my stuff ice cold. I know, shocking. Now when I dig into a pumpkin flavored treat, I don't actually want to think about pumpkins, I want to think of pumpkin pie which I believe is the best part of any holiday feast. Well, I very much enjoy the pumpkin pie flavor here. The container the server pulled from the fridge to make my blizzard was probably good old pumpkin pie puree/filling. The best part is that it's not marred by gumminess like Edy's Pumpkin Pie "ice cream". My blizzard is already melting but that soft yet cold texture is going great with the fresh graham cracker crust bits. There's a good amount of them and they've got a nice complimentary taste. No it's not regular pie crust, but this is a treat and they are doing just fine. Well, that's it, I like it! You've got two more weekends to try this, though I don't know why they don't let this one hang around for November. I just realized something, usually October is my last DQ month 'til April, but the DQ I went to is in a mall and open all year long, woohoo! I did find this trip interesting since they've added a bunch of orange julius stuff to the menu and that makes me wonder (nay, hope!) that the new DQ/OJ they are building might actually be a year round place. One can dream. Simplified Review: blizzard texture is spot on. oh the wonders of a pumpkin flavor. 2014 Update: The reign of the pumpkin pie blizzard gets a little longer each year. For 2014, it'll be available September through Thanksgiving. Oh, and it's still awesome. What the heck? The DQ near me already seems to be closed for the season. And we don't have any Arctic Circle around here. 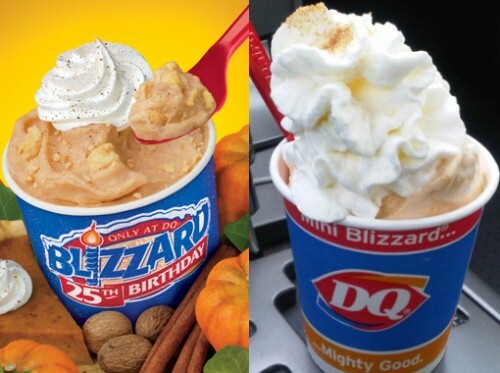 I want to try a pumpkin pie blizzard! This is an outrage! Thanks for the review, Dubba. I've been curious about this but generally wait for you as the authority on things ice cream. So I went to DQ on Saturday to get the Pumpkin Pie blizzard, I ordered a mini. My first note was that it looked really dark, like it was made with chocolate soft serve. First bite, good, I could taste the pumpkin pie pieces, the pumpkin and wait...chocolate? As I ate more, I noticed more and more chocolate pieces. Did they invent a new Pumpkin Pie flavored blizzard at my local dairy queen or was it supposed to have chocolate in it? WEIRD. @Anon: Weird, sounds like somebody was messing around (or new to working at DQ). From your wording, I'm guessing the chocolate was not an enhancement?